The loophole is being exploited to open a backdoor on a PC that could let criminals take control of a machine. The threat of infection is so high because the code created to exploit the loophole has somehow been placed on many popular websites. Experts say the list of compromised sites involves banks, auction and price comparison firms and is growing fast. The net watchdog, the US Computer Emergency Reponse Center (Cert), and the net security monitor, the Internet Storm Center, have both issued warnings about the combined threat of compromised websites and browser loophole. Cert said: "Users should be aware that any website, even those that may be trusted by the user, may be affected by this activity and thus contain potentially malicious code." In its round-up of the threat the Internet Storm Center bluntly stated that users should if possible "use a browser other then MS Internet Explorer until the current vulnerabilities in MSIE are patched." Security programme manager at Microsoft's security response centre, Stephen Toulouse, told BBC News Online: "When threats happen, we mobilise instantly. "We post warnings, which we did last night, and tell customers what the issue is, whether they are affected, what steps they can take to prevent it." He said Microsoft was aware that operating systems had vulnerabilities, but added that it was an industry-wide problem. Mr Toulouse advised users to set their internet security zone to high and to run good anti-virus software. It is unclear how the malicious code that exploits the weakness in Microsoft's Internet Explorer has been inserted on popular websites. What is known is that any Windows 2000 Server that does not have the MS04-011 security update installed and is running Internet Information Server could be at risk. The virulent Sasser worm exploited loopholes closed by this update so many servers are likely to be patched against the problem. When loading on a browsing PC, this chunk of code might trigger a Windows error message. 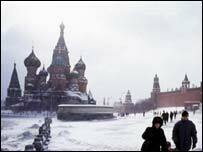 Once downloaded the code redirects a browser to a Russian website which tries to install a program that opens a backdoor into the PC. Some net service firms have started blocking access to this Russian site. Anti-virus firms are now working on putting detectors for the chunk of code in to their scanning software. Security firm Symantec said the malicious code was not widespread and did little damage. The reason that the server/browser combination has been created remains a mystery. Some speculate that it is the work of spammers looking to create yet another network of compliant PCs that can be used as proxies to spread junk mail. Microsoft has issued advice to consumers and web administrators about dealing with the problem. So far the server/browser combination has not been given a single name. 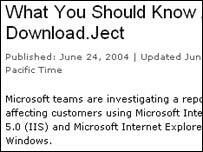 In its warning about the problem Microsoft calls it download.ject but others, such as F-Secure, are calling it Scob.